The number of Oklahomans receiving food stamp benefits has declined by 5 percent since it hit a record high in September, and officials attribute the drop to a reactivated work requirement. 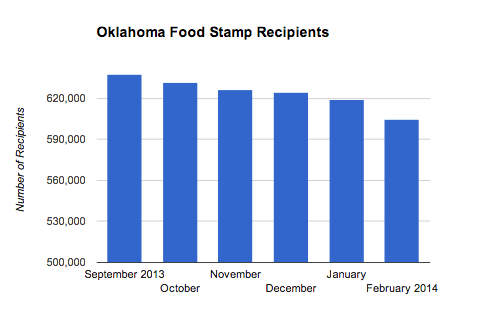 Around 604,775 Oklahomans received food stamps in February, a decline of 32,654 recipients from the program’s peak number of 637,434 in September, according to the Oklahoma Department of Human Services. In 2013, then-Oklahoma House Speaker T.W. Shannon authored a bill that passed and required able-bodied adults without dependent children to work at least 20 hours a week to receive food stamps, or Supplemental Nutrition Assistance Program. The work requirement existed before, but the Department of Human Services received a waiver from the federal government for those requirements in 2009 in the wake of the Great Recession. Although the decline in food stamp recipients has been steady since September, the number remains well above pre-recession levels. In June 2008, just before the recession hit, the number of people receiving food stamps totaled 414,843, which is 31 percent lower than the most recent number of enrollees, according to state figures. The number of Oklahomans enrolled in the state’s Medicaid program reached an all-time high in March, and officials are examining whether many people who signed up were spurred to do so by the Affordable Care Act.